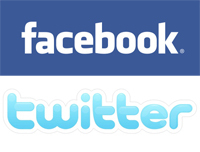 Twitter and Facebook are two of the most popular social networking sites on the internet. They allow users to connect to each other and be updated on what is happening with their friends’ lives. Facebook is a more traditional social networking site that lets you upload pictures, add friends, and post comments among other things. Twitter is also a social networking site but it is more famous for its micro blogging features that allows users to post messages from a browser or straight from their mobile phone. Posting tweets is a simple and hassle free operation where you can just post anything whenever you like using your mobile phone. Maintaining a Facebook profile takes a lot more work because you would need to update or add pictures to keep your profile current and this usually means using a computer or a laptop. Considering popularity in the media, Twitter has an edge over Facebook. Facebook gets a mention in the news now and then when it makes some news worthy buzz. There are some TV shows that have their own Facebook profile, but its nothing compared to Twitter. Most TV shows who likes to get feedback from their viewers instantaneously uses Twitter, and some shows even devote their time looking at tweets. It has also become a quick and easy way to get the word out in case something happens. There are also a lot more famous people who use the Twitter service than Facebook. The famous people who are on Facebook are usually movie stars who want to gain even more popularity. Twitter provides famous people an instant look on what their opinions are on certain matters instantly without needing them to regularyly visit their profile page. The tweets get sent to the followers who are subscribed to their feeds just like an SMS. Even politicians have gotten on the Twitter bandwagon. They use this to let their constituents know what is happening with them or to informally do press releases. This capability is very important to them to perform quick damage control when something that they don’t like happens. Ben Joan. "Difference Between Twitter and Facebook." DifferenceBetween.net. August 7, 2011 < http://www.differencebetween.net/technology/internet/difference-between-twitter-and-facebook/ >. Pefect, thanks for the clarification. Now if only the rest of my facebook friends knew this.